I really enjoyed the whole MQX experience from the Ice Cream Social to my last class on Saturday. Saturday afternoon I taught “And Now What? !” and showed off my new Dansko clogs as quilterly inspiration. I enjoyed all my students. Two gals took all three of my classes, which was rather fun to see a familiar face from class to class. 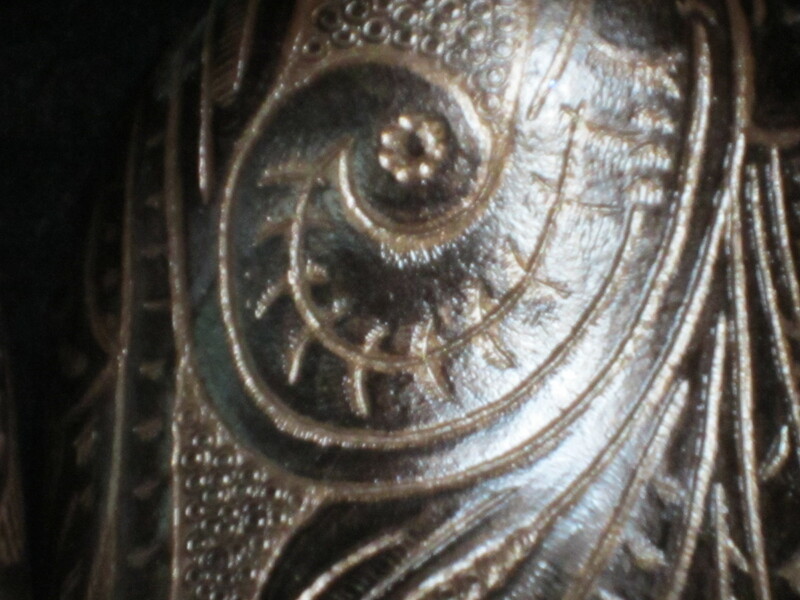 They really got into the whole figuring out motifs in Saturdays class. There are so many highlights of this week, the most important to me was watching the new/ish machine quilters just get it. I see that look, the machines slow down, the breathing changes and the quilters quilt and I can see that each quilter is well on their way to good machine quilting. One quilter shared with me that her friend had been trying to get her to machine quilt for 2 years and she kept saying no (and here’s the best part for me) after taking the Beginner class on Tuesday she felt like she could machine quilt and was ready to keep going at home. She understood that she would need to practice and she would. Right before I left I came up with a one page handout for the quilters in both classes, the title eludes me at the moment but I know I listed 15 tips with “slow down” twice. Slowing down to a good medium speed helps quilters achieve a good consistent stitch making those straight lines and curves much easier. 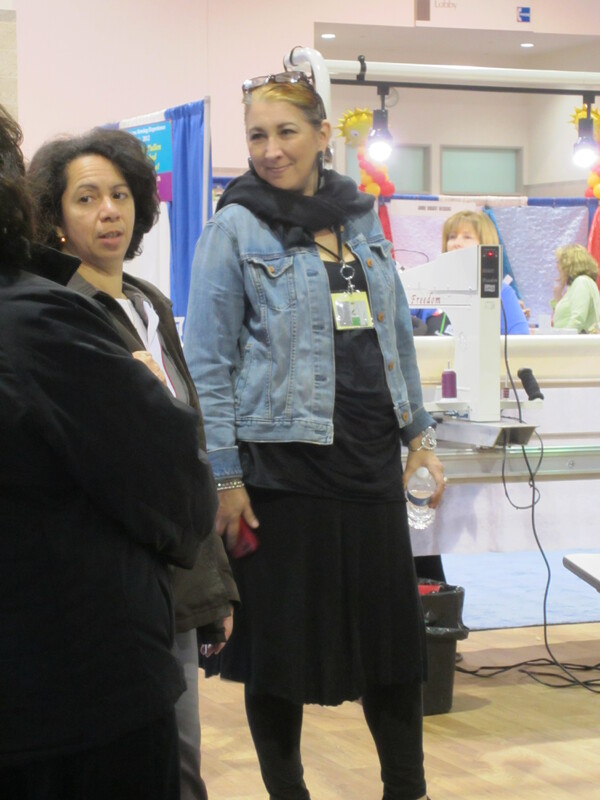 Blaine’s Sewing Machine Center provided the classroom machines this week and had a booth on the show floor. Bob & Karen Roy, owners, are just warm and welcoming! Heather, the classroom educator, is just delightful and very responsive to the needs of the students. If you’ve taken my class you know I issue speeding violations for moving too quickly. Heather, while working on a machine to figure out what wasn’t working quite correctly ran the machine full-tilt for a few seconds to listen to the machine. I had my back to the class as I was with a student a the white board showing her the motif we’re working on . I heard the machine running and turned around and said, “Slow! oh never mind” Heather laughed. Silly me. The gal on the right is Karen Roy, owner of Blaines and Nancy is on her left. I do have another photo with Heather but it must be in my other camera. If you’re ever in Cranston RI stop in and see them. 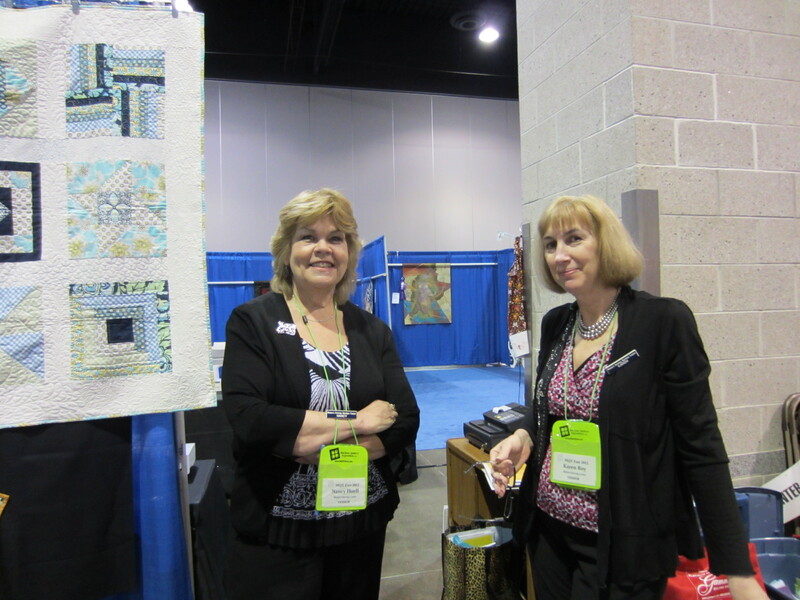 Karen McTavish taught this week and spent some of her time in the APQS booth which was right across from the Bernina booth. She is so sweet and encouraging. We chatted a bit about teaching. I think we’ll both be in Houston in November. I had a Paula Reid magpie moment when I went to say hi to Betsy from Quilt Essentials in Auburn, ME. She had all of this beautiful Robert Kaufman Radiance. OH MY. I bought some and then got some for Jeanie. I love shopping for other people! I’ll share more later this week about this very fun trip including a few pics that have already been on facebook. I like the magpie moment — wish I had been there to drool over everything with you! Well, I just finished my block that I started in your class and I’m kind of proud of it; thanks to you Teri. I must figure out how to send a photo since I’m new at this technology. Big hugs for giving me a new creative outlook on my work!!! I also took a class with Karen McTavish and she also gave me great inspiration as far as pushing my abilities. I think I’m still on a high from both of these classes if that makes any sense. I’m so glad your experience at MQX was so great! I bet your students LOVED your classes. Sounds like a whole lotta fun! Can you get those clogs on line? I wonder if my local shoe store would order, if not? Questions, questions!